Whole clusters of healthy grapes are pressed. The press fractions are separated as a function of quality. Harvesting, grape transport and the press method used are all important. Presses are meticulously cared for and regulated by law. Phase 2 : Transforming the still base wine into a sparkling wine. This transformation occurs in the bottle. - Formation of a deposit. 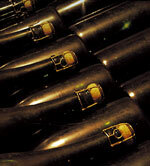 Clarification in the bottle = riddling = turning the bottles to collect the deposit in the bottle neck.